Honoring Influential leaders in Black History!!!! Africa Davis is a dedicated student an actively involved at Wilson- Gray YMCA. 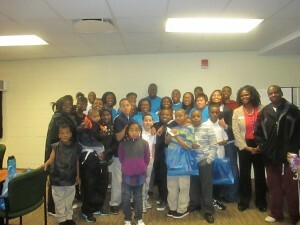 She participates in our Youth Achiever’s program as well as volunteers for a number of projects. Students were asked to participate in a Black History project. The concept of the project was to empower the students to get a deeper understanding of their heritage. 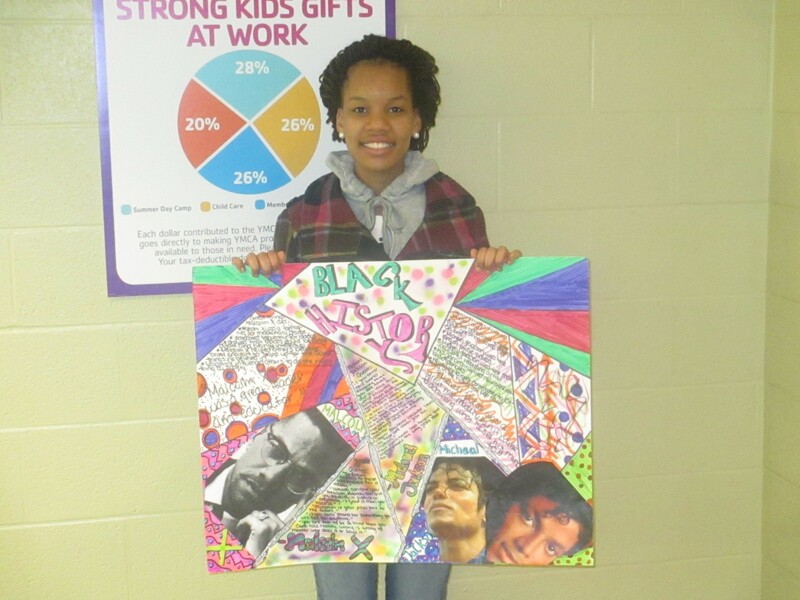 Africa utilized her artistic skill set to make a poster acknowledging Malcolm X and Michael Jackson. She highlighted the great things that each of these prominent figures have done. “Malcolm X was a great leader and educator.” She also goes on to say that “Michael Jackson was a great role model when it came to achieving what he set his mind to.” This project gave Africa a better understanding of influential leaders that paved the way for those that we see in the public eye today; while also honing in her artistic talent. We are pleased to have a future leader eager to learn and assert herself in her history. Great Job AfricaDavis!!! 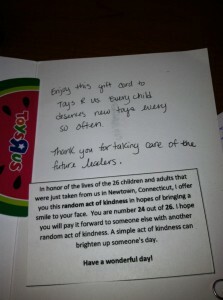 Yesterday at the YMCA Child Care Center, we received an anonymous letter with a Toys R Us gift card and note inside. I cannot do the note justice – it touched all of our hearts in a tremendous way and is truly in the spirit of our Pay it Forward Strong Kids Campaign theme this year. We will certainly be paying it forward..
As a site director I have seen many changes in our children with in the very few months that I have been with the Y. One of the best things is when a child comes to me upset because she misses her mommy and begins to cry. I then took this child onto my lap and hugged her. I reassured her that mom was just working and that she would see her soon. I then asked her if she had mitten/gloves for when we went outside. She shook her head no, so we then went over to Mrs. Jen’s prize box and pulled her out a pair of pink mittens. This brought a smile to her face and when we went outside she played with the other children as happy as could be. As a mom I know the feelings that children are overcome with. This particular child has a mom that works long hours and she is often taken care of by an aunt or grandmother. As a counselor it brought me joy to know that I was able to comfort her and to put a smile back on her pretty face. A new member just walked up the the Wellness Desk at the Indian Valley Family YMCA. She looked perplexed and commented that the Zumba class was too full, so she was hoping for a little help with the equipment before she got too scared and walked out of the Y. The Wellness Attendant on shift as well as two staff who were nearby, working out, all moved in the member’s direction and offered to help…. She’s on a treadmill now, chatting with a new friend and looking happy to be here! Often at Camp Jewell we get asked why should we send our child to summer camp? We could spend hours explaining why but here are our top five! 1. Lifelong skills, and lifelong friendships! Research shows that camp helps children make new friends, get to know kids who are different from them, feel good about themselves and try things that they were afraid to do before. All of which confirms that camp helps build the necessary skills to become successful adults. 2. Kick start an active lifestyle! Whether trying their hand at archery, canoeing with a friend, or playing a game of Capture the Flag, camp provides children the opportunity to try new things and get moving. According to surveys by the Center for Disease Control, an American child is six times more likely to play a video game than to ride a bike on any given day. Surveys show that 63% of children who learn new activities at camp continue these when they return home. 4. Get in touch with nature! For kids today, the world is different from when their parents or grandparents were children. In many cases, the safe zone where kids can play might only extend to their back yard. Camp lets children unplug from all the technology and enjoy the world around them. Studies show that this valuable time a child spends outdoors can help them recover from pre-existing stresses and help them concentrate and connect to the natural environment around them. 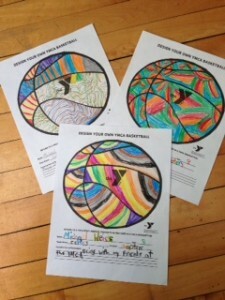 Through one of our communication pieces to all of the families in the West Hartford Y 2013 Basketball League, we had sent out a “Design your own Y basketball” with a question of what is their favorite part about basketball. 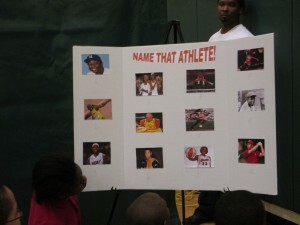 These pictures were designed by Michael, 8 years old and on the Celtics Team in our Shooters Division (Grade 3 &4). He took the time and energy to create not just one, not two, but three creative and colorful Y basketballs. He has then wrote that his favorite part about basketball is playing with all his friends the YMCA! Michael took the time and energy to express his positive thought about having a great time with his coaches and teammates at the YMCA! They let me be me and like me just the way I am, Mom! We recently received a phone call from a parent who registered their child for our Ranch Camp last year. Their daughter was not particularly into horses and riding, yet was open to giving it a try. Their daughter had been adopted from Russia and had been institutionalized for a period of time before they were able to bring her to the States. Because of that and the fact that she struggles with her weight she gets bullied at school. Her parents thought that they would try Camp Jewell Ranch Camp as a release for their daughter and our one-week program was a great way to see if she would take to it. Mom said she came home from camp last year and CJ Ranch Camp is all she talked about. She loved the horses, loved the staff, and loved all the new friends she met up at Hide-A-Way. She exclaimed to her mother that it was so great here because nobody picked on her; everyone was so nice and all her cabin-mates took to her, accepted her just as she is, and she really felt part of the group. Most of all, Mom said that her daughter took such pride in what she accomplished during her stay with us at Ranch Camp. She even begged her parents to enroll her in riding lessons while at home, and she is so excited at the thought of coming back to Ranch Camp this summer (for TWO weeks this time!) that she can’t hardly wait. The mother said she has never seen such a transformation in her daughter and such excitement about coming to camp in a few months. She cannot wait to see the friends she made last summer and ride her favorite horses again. She has photos of her favorite CJ horses and new CJ friends up on her bedroom wall. They are so thankful for Camp Jewell, our Staff, our Ranch Camp Program, our fellow Ranch Campers and our horses, and what all have done to help transform a shy and withdrawn girl into a happy, excited and more confident daughter. “Congratulations and a heartfelt GOOD JOB!! !” from me to all of you who helped make my daughter break free from her shell here at CJ! You guys are who make Camp Jewell The BEST! It’s not my job. It’s my duty as a human being! 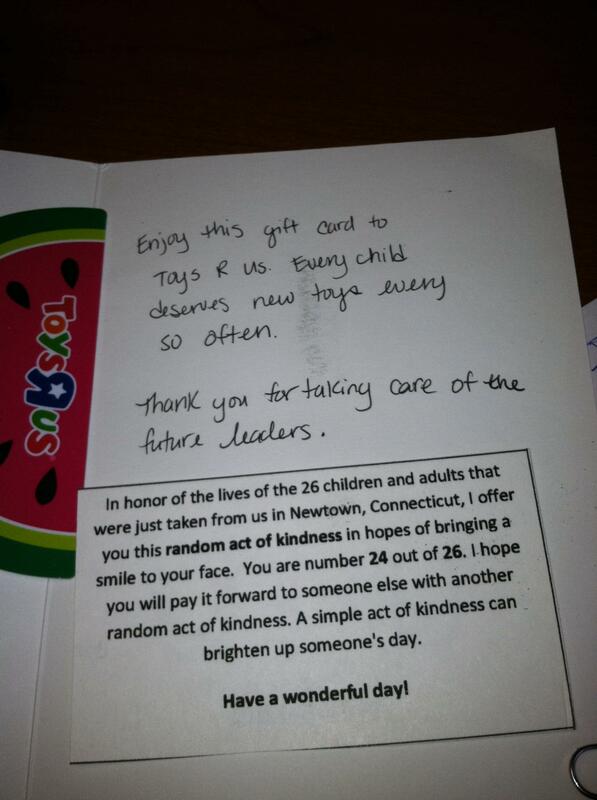 I have been blessed with the most amazing friends that I have found at the Wheeler Regional Family YMCA. As a SPIN instructor, Tri Club leader and Member Engagement Specialist, I have come across so many types of people who share the same goal, “to bring happiness and health into their lives”. I know that it is my job to teach SPIN class, to lead our members through our Tri Club or to engage with our current members and new members. But to me, it’s not just my job. It is my duty as a human being, as a 39-year-old woman, as a friend and as someone who really cares, to be that therapist, cheerleader, support group, adviser and friend. One Thursday at 9:30 a.m. I had met with one of our members, my friend, so that she can talk about things that she has been battling with. I asked her to bring her running gear and we went outside for a 4.5 mile run to talk. We solved every problem possible during that run and when we returned I could not believe how fast the run went and I could not believe how amazing it was to engage with this member while breathing in fresh winter air. What a great feeling it was for me to help her out while plugging in a workout for the day! As a YMCA employee I find myself talking to our members all the time. They confide in me, they ask me for advice, they share personal stories, they look for words of encouragement and they want to be my friend. Another member had reached out to me and asked for some support during her battle with losing her best friend and dealing with depression. As a person who cares, I was her shoulder to lean on. I was there to listen and offer her my friendship. So if doing my job means to be friends with our members, help them through difficult times, help them achieve their goals on becoming a triathlete, push them hard in the SPIN room and keep them coming back for more, then I have the most amazing job ever! This week, the wellness center hosted a community outreach event in collaboration with Pratt & Whitney. 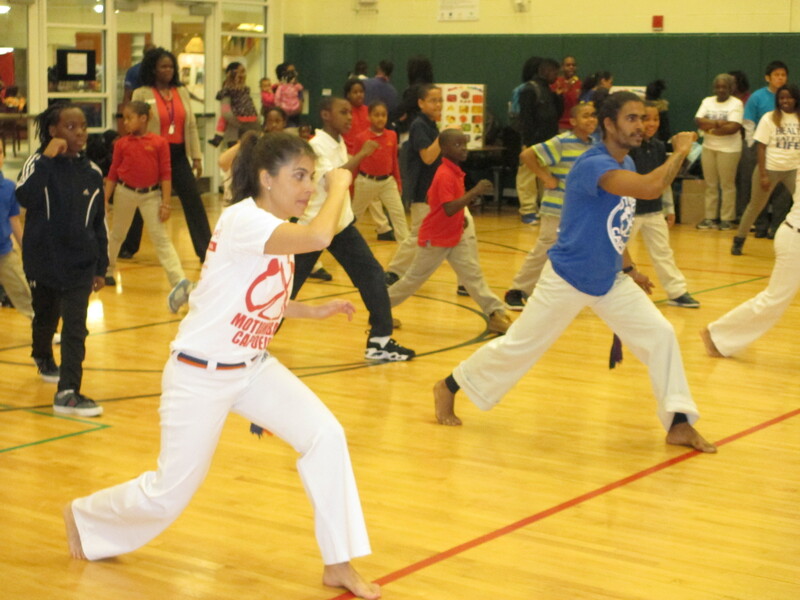 It was a fun and educational event inspired by First Lady Michelle Obama’s “Let’s Move” campaign against childhood obesity in conjunction with our celebration of Black History month. The night included children participating in an African-American Sports Trivia game, where participants were given the task to match an athlete’s profile with their picture. Also, the teens took part in a taste testing where they had the opportunity to try new fruits and vegetables that wouldn’t normally be in their daily diet like raspberries, papayas and zucchinis. Then everyone was entertained by a James Brown inspired dance piece performed by the “Let’s Dance” Program. Lastly but certainly the most intriguing activity of the night was an interactive Capoeira demonstration. Capoeira is a Brazilian based martial art that combines elements of dance and music that was developed by African Slaves and Brazilian natives in the 16th century. 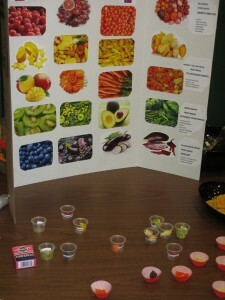 Participants came away with a deeper knowledge of black history and learned new and exciting ideas for a balanced diet and exercise.